If you haven’t noticed, the ETF market has EXPLODED over the last ten years. The Investment Company Institute estimates that over 5.2 million Americans now own ETFs. There are currently over 1400 that trade every day, which constitutes about $2 trillion. When they were first introduced, ETFs only tracked specific indexes. Funds tracking the S&P 500, Dow, and NASDAQ were three of the very first. Then others came along, tracking specific sectors within the indexes, like tech or agriculture. Now, there’s an ETF for just about any index or strategy you want. Want to invest in a bunch of gold mining stocks simultaneously? Boom, buy GDX. Only interested in socially responsible companies? KLD or DSI might be right for you. The variety available today may be great for active investors and rapid day traders. But there is a large overlooked risk attached to investing in ETFs: the more obscure the ETF, the higher the risk that the security you bought doesn’t actually track what you think it does. When you buy a mutual fund, the transaction is pretty simple. You give some cash to the fund company, they give you shares in return. The amount of shares you get is based on the net asset value of the fund, which the fund company is required to calculate every day. When you buy an ETF, you don’t transact with the fund sponsor. You buy it in the market from another seller. But where did the seller get it from? How are they created? First, a sponsoring bank that wants to create the ETF builds a list of securities the fund is supposed to track. For example, State Street sponsors the ETF SPY, which tracks the S&P 500. They stipulated that each share of SPY would be the equivalent to a proportional share of the entire S&P 500. Next the sponsoring bank reaches out to “Authorized Participants,” or APs. APs are other banks and brokerage firms who agree to help the sponsoring bank create the ETF. After agreeing to become an authorized participant, a broker will take the list of securities from the sponsoring bank and buy every single one on the open market. Once they hold the right “basket” of securities for the fund, they deposit them at a third party custody bank. At this point, the APs are free to “create” shares of the ETF. They’ve bought all the underlying securities and socked them away at the custody bank. They can then create a proportional number of ETF shares, and sell them on the open market. For example, an authorized participant for SPY might want to buy one share of every stock in the S&P 500. If State Street’s (the sponsor’s) index ratio is 100 to 1, the AP would then be free to create and sell 100 shares of SPY on the open market. And if you bought one, it would represent 1/100 of the entire S&P 500. After an ETF is created, it trades on the open market. But since its price is based on supply and demand, there’s potential for ETFs to deviate from their net asset value. This is why the role of authorized participants is so important. When a broker is an authorized participant for an ETF, part of the gig is promising to continue transacting in the shares. And just like APs create shares by purchasing the underlying securities, they can destroy shares just the same. When destroying shares, an AP that holds shares of an ETF can redeem them for the underlying securities. And whenever the price of an ETF deviates too much from the price of the fund’s underlying securities, there’s an arbitrage opportunity for authorized participants. Let’s say that an ETF closes the day at $100. Each share of the ETF represents 1/250 of a group of 1000 different mid cap stocks. If you summed the prices of each of the 1000 different stocks, they should add to $25,000 ($100 * 250). This kind of transaction happens all the time. The spread and incentive for APs is never this large, but the activity helps keep the price of the ETF close to the securities it’s representing. This is hugely important, and ETFs couldn’t function otherwise. ETFs like SPY trade in the hundreds of millions of shares per day. They have numerous authorized participants constantly transacting, which keeps the market price very close to its net asset value. But what if the authorized participants stepped away? What if they decided there was too much risk in these ETF transactions, or their capital was better used elsewhere? Since most, if not all, authorized participants are large banks and brokerage institutions, they all must abide by strict capital restrictions. In times of financial stress – the very time an ETF is most likely to deviate from its net asset value – it’s possible an AP might even be forced to step away from the market to preserve capital. This is the biggest risk to investing in ETFs. 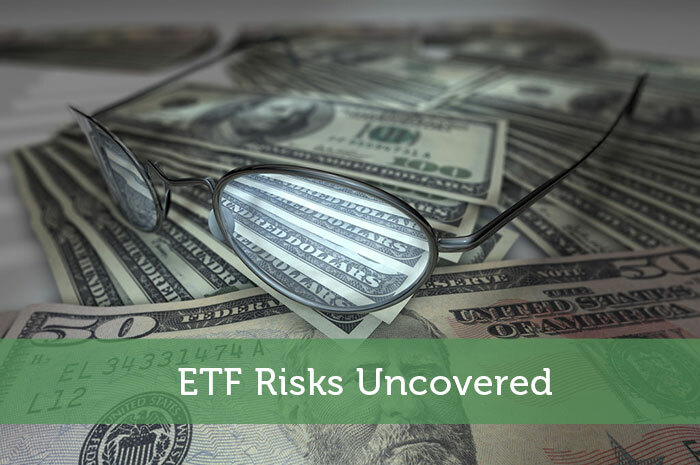 Without authorized participants to come in and apply pricing pressure between an ETF and its underlying securities, there’s nothing to keep them in line. You could buy an ETF that falls to 50% of its net asset value – which I’m sure isn’t what you’d be looking for. OK OK, But Why Should I Really Care About This? In my opinion, for most ETFs today there’s a very remote chance of this happening in a way that harms investors. Most of the ETF market is made up of very highly traded shares, like SPY. There is enough “attention” focused on SPY from APs and investors at large to ensure a pretty tight spread. But as you know, not all ETFs are as transparent and “plain vanilla.” ETFs can be opaque, in terms of asset class, composition, and leverage. For this reason, the more opaque ETFs don’t have as many authorized participants and are at higher risk of a substantial deviation. Plus, the liquidity of underlying securities in opaque ETFs can also be pretty thin. All in all, I really like ETFs for their cost effectiveness and tax efficiencies. But I’d caution everyone to make sure they understand the security they’re buying. If it’s an off the radar asset class or one that doesn’t trade often, think twice before buying it. Even though it might seem convenient to buy an entire asset class, there can be substantial risk and tracking error. Grant Bledsoe is the author of the personal finance blog Above the Canopy.